The two-headed ogre Cho'gall, a World of Warcraft mainstay, is finally making his way to Heroes of the Storm, Blizzard announced today at BlizzCon. And he will be a very unique character in a couple of different ways. 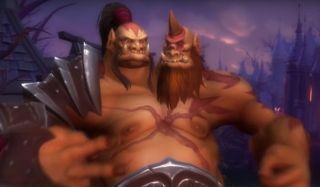 For one, reflecting the fact that he has two heads, Cho'gall will be controlled by two players simultaneously, only one of whom actually needs to own him. Even more interesting is how he'll be distributed to players: He won't be available for purchase, but will instead be given to all BlizzCon attendees and those who purchased Virtual Tickets. From there, he'll spread virally: If you play at least two games on a team with someone who owns Cho'gall, then you'll get him for free as well. Playing four games with Cho'gall will net you some in-game gold as well. The Cho'gall news came alongside the announcement of a new Arena mode, which is meant to be "quick and easy to jump into" but will demand significant flexibility from players. Hero selection will be randomized and taken from the entire Heroes of the Storm lineup, including players you don't own, and after you've spawned you'll have to choose a single heroic for your character. Fights will take place on small maps built around a single objective, with layouts changing slightly with every new round. Blizzard will no doubt have more to say about what's coming in Heroes of the Storm during the "Hero Deep Dive" panel scheduled for later today. We'll keep you posted!